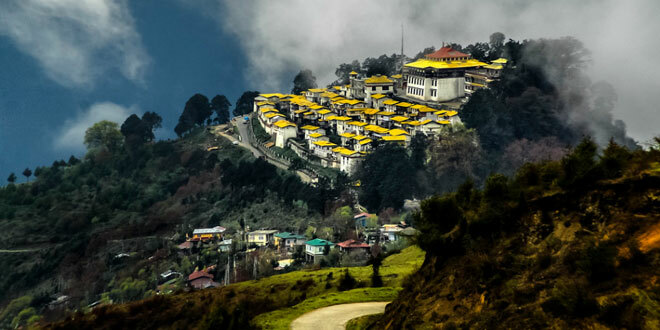 The capital of the state, Arunachal is scattered with light, earthquake-proof, wooden-framed buildings rising up the slopes of green hills. Traditional huts are strewn amongst the more recent constructions. The residence of the Governor crowns one peak while a new Buddhist Temple crowns the other. Between them lie administrative officers, shops, daily bazaars and thatched houses. The nearest Airport is Lilabari in Assam, 57 km from Nahariagun and 67 km from Itanagar. Nearest Railway station is Harrmoty in Assam. 23 km from Naharlagun and 33 km from ltanagar. The station is served by Arunachal Express. Itanagar is connected by daily bus service from Guwahati and the other cities of Assam. Arunachal State Transport buses are plying throughout Arunahcal, Assam and Meghalaya. Private transport operators also run Deluxe Coaches on many routes. Direct bus services are available for Naharlagun/Itanagar from the following places: Guwahati (381km), Shillong (481km), Tezpur (216km), Dibrugarh (375km), Tinisukia (415 km), Jorhat (245km), Nagaon (275km), Namsai (495km). Local Transport : A very small number of un-metered Taxis are available. Tourist/Deluxe buses are available on rent from the Director, Tourism, Govt. of Arunachal Pradesh, Nahariagun. A few other transport agencies in town rent out tourist cars and coaches. Cycle rickshaws are the most common local transportation in Naharlagun only. The Buddhist Temple A new but beautiful yellow- roofed shrine, it rises from wefi-rnaintained grounds behind a stupo tree planted by His Holiness The Dalai Lama. The grounds of the temple afford a good view of Itanagar Town. Ganga Lake (Gyaker Sinyi) The 6 km drive to the lake from Itanagar takes visitors on a rugged road through some superbly primeval jungles, Bamboo groves, orchids massed on tall trees are some of the vegetation which can be identified by the interested travelers. Stopping at the base of a hill, one has to take a flight of steps uphill. At the top of the ridge one looks down on a serene green forest lake which one has to cross in a row boat. Today, it Is a beautiful spot for outings, boating and picnics. The State Museum: In the gallery at the ground floor, the political and administrative development of the area, population of the various tribal groups as per 1991 census (provisional), sociocultural heritage of the people and their lifestyle have been depicted, with the help of maps and Dioramas. While the fife-styles of all the major tribes have been depicted, the display maps cover a wide range of subjects such as the people, house types, festivals, dances, handicrafts, textile designs, musical instruments, weapons of war and chase, important developments, Malinithan, Itafort, Noksaparbat, Kundil valley civilization and historical sites. Polo Park: An interesting little botanical garden atop a ridge overlooking the town. Visitors should notice the cane thicket, it looks a bit like a palm with spines on its stems, but grows as a bush. There is a small zoo. Where to Buy: The main Sales Emporium is located at Itanagar, from where the handicraft items are available. Handicrafts Center This establishment offers a good range of shawls, carpets, carved baskets and the beautiful cane and bamboo works in which the North East excels Behind and on one side of the showroom, is the workshop where cane is heated, cut and woven by tribal artisans with great skill. Actual specimens of arts and crafts particularly wood carving objects, musical instruments, headgears, religious paraphernalia etc. have been displayed in show cases. Thus the ground floor gallery gives a panoramic view of Arunachal Pradesh. The gallery on the upper floor has six sections-textiles, archaeology, ornaments, basketry, weapons and household articles. Actual specimens from among the different tribes of Arunachal Pradesh are on display under different sections. The Archaeology Section has been arranged to give some idea about the heritage of the state, found at excavated sites of Malinithan, Itafort, Noksaparbat, Bhismaknagar have been exhibited. Closed on Monday. Places ideal for Trekking , Hiking,Angling, Rafting, Rock Climbing. Ideal for Trekking, Hiking and Angling on the river Siyom. Nearest rail head is Silapathar. By bus and car from Likabali and Pasighat. Clothing : Woollens in winter, Cottons in summer. Starting at the airport of Tezpur in Assam. The road passes through low wooded slopes, about 60 kms beyond Tezpur. Anglers and those who want a brief rest, should wait till they encounter the broad spread of the Bharali river as it emerges from the mountains into wooded upper plains. On the Banks of the river, at an elevation of 190 metres is Tipi, a glass house with over 7,500 Orchids. From here the road is fairly steep as it soars up to the small headquarters of the West Kameng district. Bomdila at a height of over 2530 metre. It has a Tourist Lodge, a Craft Center, Apple Orchards and Buddhist Gomphas. There are also views of Himalayan landscapes and snow-clad ranges. Bomdila is a good place to rest overnight. Nearest airport is Tezpur (160 kms) served by Indian Airlines & NEPC Airlines. Railway station is Bhalukpong (100 kms). Bus services of Arunachal Pradesh State Transport Corporation and Assam State Transport Corporation are plying to Bomdila from Tezpur via Bhalukpung- Tipi-Tengavafiey-Rupa. Reservation Authority: Deputy Commissioner, West Kameng District, Bomdila-790 001 Tel- (03782) 22021 (0), 22022 (R). Craft centre, producing very fine carpets of colorful designs and masks and Buddhist monasteries. Ideal for Trekking and Hiking. A place of great sanctity, it is situated in the lower region of the Slang District.This excavation presents a view of a clear picture of temple or a number of temples which Malinithan was once adorned with. The place is also aated with the Krishna legends. Akashi Ganga waterfalls, 5 km away from Malinithan where people take a bath to wash away sins. Nearest airport is Lilabari, only 110 km away. Nearest rail head is Silapathar (10 kms). Direct buses are available from Itanagar (185 km) via North Lakhimpur (109 km). Nearest airport is Lilabari by NEPC airlines and Dibrugarh by Indian Airlines, Sahara, NEPC Airlines. Nearest rail head is Murkongselek. By bus and car from Itanagar, North Lakhimpur and Silapathar and by ferry from Dibrugarh to Oiriamghat and from Oiriamghat to Pasighat. Circuit House and Inspection Bungalow. Ideal for River Rafting, Boating and Angling on river Siang Trekking and Hiking. Dr. D. Ering Wildlife Sanctuary where vaid buffalo, tiger, sambar deer and wild ducks are found a plenty. Clothing: Woollens in winter and cottons in summer. Best season to visit: November to February. Ideal for Trekking, Angling, Rafting, Rock climbing. Situated in the lower reaches to the river Lohit. It is a religious place visited by people from all over the country during the Makar Sankranti day for a holy dip. Common belief that a dip on the day in the kund washes away one’s sins. As recorded in the Kalika Purana that it was here the sage Parasuram washed away his sin of matricide. Nearest Airport is Tezu (20 km) served by Vayudoot. Indian Airlines, Sahara & NEPC Airlines touch Dibrugarh (140 km) on alternate day. Daily bus services are available from Tinisukia (140 km) via Namsai and by ferry from Dholaghat to Sadia and by bus for Sacha for Tezu and Bhismaknagar. Ideal for Trekking and Hiking, River Rafting and Angling on the river Lohit. Festivals: Tamladu on 15 Feb. Sanken on 15 April. The grandeur of Arunachal not only lies in its colorful tribes but also in its rich flora and fauna. Orchids find a pride of place and more than 500 species are to he found in Arunachal alone. An Orchidarium has been act up to study this botanical paradise at Tipi (seven kilometers from Bhalukpong). Nearest airport is Tezpur (60 kms). Nearest railhead is Bhalukpung, Tipi (7 kms). Tourist Taxis are available at Tezpur. Daily bus services are also available from Tezpur (60 kms). Inspection Bungalow, Bhalukpong Reservation Authority E.A.C., Bhalukpong. Forest IB, Tipi Reservation Authority Divisional Forest Officer, Bhalukpong. Reservation Authority : Tourist Information Officer Govt. of Assam, Bhalukpong. Nearest airport is Tezpur and Ulabari by Indian Airlines and NEPC Airlines. Nearest railhead is North Lakhimpur by Arunachal Express from New Bongaigaon. Direct buses are available from Itanagar and North Lakhimpur. Tarin Fish Farm (a high altitude fish farm), Pine and Bamboo graves, villages, indigenous method of rice cultivation, craft centre. Festivals: Nyokum on February 26. Dree on July 5. Ideal for Trekking and Hiking. Clothing Woollens in winter and Cottons in summer. Mr.Dasgupta, very good arrangements. I really appreciate your patience while I have found you standing in a long queue of Elephant Safari booking counter in Kaziranga National Park and finally you have managed our safari during this peak period. Although personally I feel, kaziranga require more care and safety.